Jordan Busby receives Samford's first Bachelor of Science in healthcare administration degree. 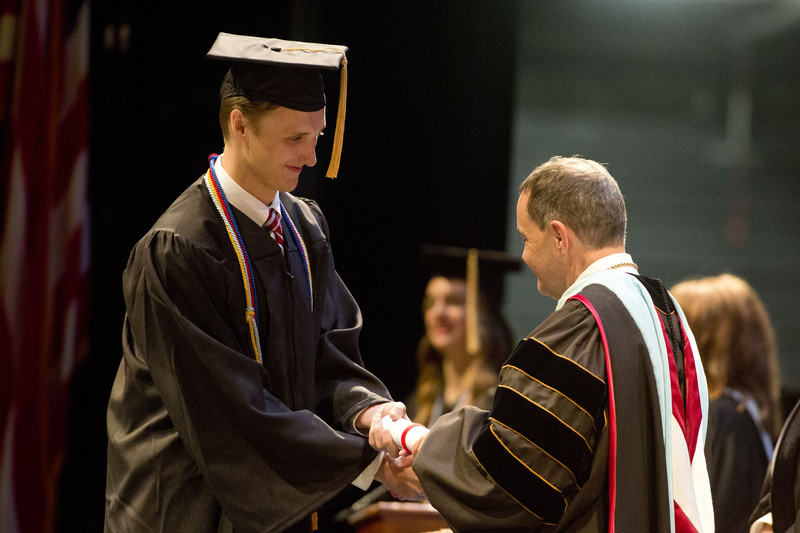 Samford University’s College of Health Sciences continued its commencement season with its spring ceremony for undergraduate programs. The four schools in the college—School of Health Professions, Ida Moffett School of Nursing, McWhorter School of Pharmacy and School of Public Health—awarded 216 degrees at the May 11 ceremony in the Wright Center. The ceremony marked the first degrees awarded for Samford’s Bachelor of Science in healthcare administration from the School of Public Health. Four students representing each of the four schools spoke on the theme of calling, sharing how people and experiences have impacted their lives and equipped them with the knowledge and skills to excel in their future careers. Emily King, a nursing major in Ida Moffett School of Nursing, shared words of encouragement, telling her peers that answering their calling will not always be easy. Nicole Klaubert, a communication sciences and disorders major in the School of Health Professions, supported King’s statements with stories of her own growth and transformation. On the first day of her freshman year, she read a letter from her sister, a Samford alumna. The letter told her that she will be amazed at how much she will grow and change for the better during her four years at Samford. Klaubert thanked the faculty for instilling in her values of faith, service and excellence. “They showed us the value of service by going above and beyond, demonstrating that no act of service is too small,” she said. Kylie Durrance, a nutrition and dietetic major in the School of Public Health, earned her second bachelor’s degree after decided that her calling in life was leading her down a new career path. She left her job in investment banking, knowing she was called to a career as a registered dietitian. “I cannot explain how, but I knew deep down in my soul that God put me on this earth to make a positive difference in the health and lifestyle choices of the public,” she said. Durrance said she is continually amazed at how God is working in her life, using every experience to ensure her future, including bringing her to Samford. “My hope for you, graduates, is that you are able to discover what God has in store for your lives. Following your calling can be confusing and intimidating at times, but I promise that if you are walking with God in the life He has planned for you, it will be well worth it,” she said. As part of the ceremony, McWhorter School of Pharmacy awarded its second year Doctor of Pharmacy students with a Bachelor of Science in pharmacy studies, honoring its student sfor reaching the halfway point of their program. Geoffrey Hunt, a second year Doctor of Pharmacy student, said he could not have made it to this point without the support from his professors.